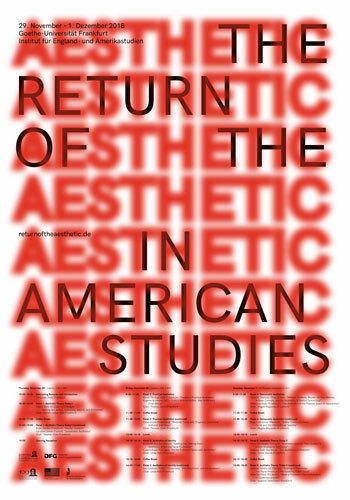 The Institute for England and America Studies at Goethe University is hosting an international conference with the title „The Return of the Aesthetic in American Studies“. Speakers will examine the status of aesthetics in various disciplines, and its relationship to politics, economy and society. Aesthetics is coming back. For the past forty years, scholars across the humanities have routinely rejected aesthetic inquiry as ideological, exclusionary, or politically quietist. In American Studies particularly, this anti-aesthetic attitude has congealed into the field’s common sense. Only in the most recent past have several scholars begun to pay renewed attention to the aesthetic and to rethink its relationship to the spheres of the social, economic, and political. The conference brings leading thinkers from the US and Europe together and critically takes stock of recent returns to the aesthetic. The programme will look more closely at two different conceptions of the aesthetic: one focusses on artwork, the other revives the Greek origin of the word “aesthesis”, and focusses on sense perceptions in general. Can the assumption of art’s aesthetic autonomy unfold into utopian political potential? Or is the aesthetic – as “aesthesis” – perhaps even a driving force of capitalism and populism? Speakers include: Walter Benn Michaels, University of Illinois at Chicago, Caroline Levine, Cornell University, Lee Edelman, Tufts University, Elisabeth Bronfen, Universität Zürich, Winfried Fluck, Freie Universität Berlin etc. The conference is free of charge to the public.